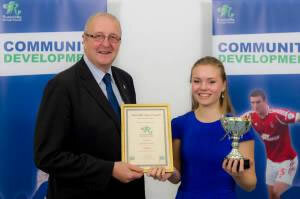 Congratulations to Claudia Southwell who has won the Rushcliffe Young Volunteer of the Year Award. Claudia plays netball when not playing hockey and chairs the Sports Council. She is committed to encouraging the development of a range of new sports in schools so that all students are able to find a sport in which they can do well and express themselves. Well done Claudia. Here she is with Cllr Cottee receiving her well deserved award.